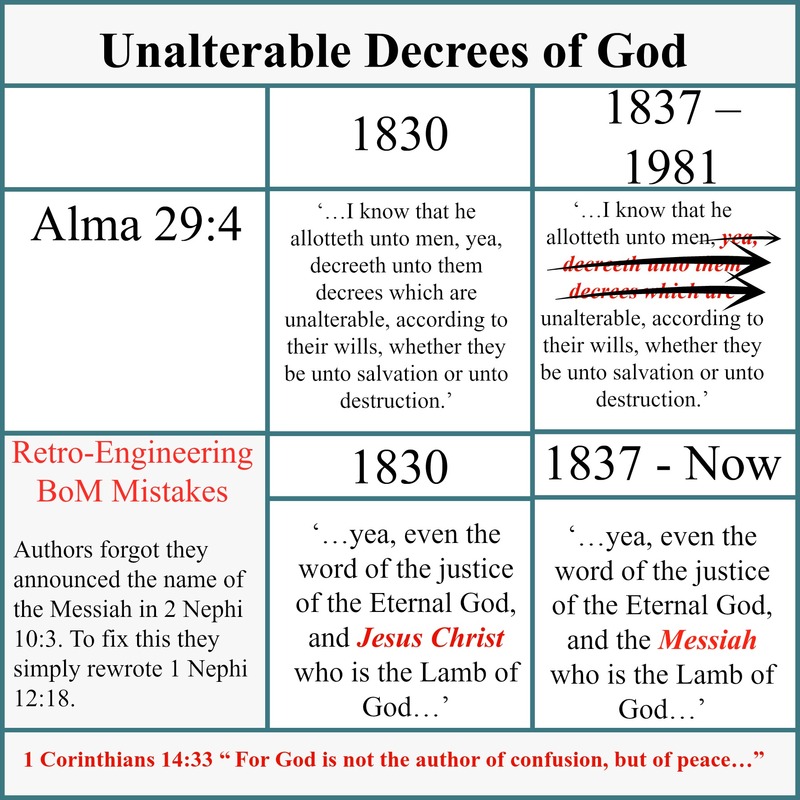 Truth, they say, is stranger than fiction and never was it more so than with the presence of Mormonism. The reasons why this church flew under the radar for so long are as numerous as the changes made to its premiere canon. One of the first publications documenting the massive changes, ‘3,913 Changes in the Book of Mormon’ was produced by the Tanners – you can order a copy at Utah Lighthouse Ministry. The next big publication was written by Royal Skousen, a professor of linguistics at BYU. His book, ‘The Book of Mormon, The Earliest Text’ identified 5,280 variations from all editions of the BoM. Still others can be found in numerous places like Jim Spencer’s BoM Comparison Machine (my personal favorite! ), or ‘Color Me Confused’; a fantastic workbook written by Colleen Ralson about 20 years ago when she worked at the Nauvoo Visitor’s Center. Regardless of the evidence, we see how members are still repeating the ill spoken words of Smith, not realizing as they do so the number of changes just keeps on growing. Today we’re limiting our look at the changes to just a couple of examples. 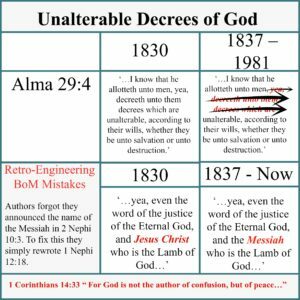 The ‘Unalterable Decrees of God’ from Alma, and how they retro-engineered mistakes they discovered about Jesus in 1st and 2nd Nephi. If you’re LDS, what are your thoughts on this and does it bother you? Is this really the ‘most correct book on the face of the earth’, as Joseph Smith declared? ← Where is Joe Smith’s Bible Translation?